Are you looking for a study guide on Mechanical Ventilation Troubleshooting? If so, then you’ve definitely come to the right place. This page is loaded with helpful practice questions that can help boost your knowledge when it comes to troubleshooting all the different problems with mechanical ventilators. As a Respiratory Therapist, unfortunately, you are going to run into problems with patients that are receiving mechanical ventilation. And it’s your responsibility to troubleshoot and fix said problems. Not to worry, though, because as long as you take the time now (as a student) to learn the most common issues, you will be more than prepared to take action and fix the problem once it arrises. So are you ready? Let’s go ahead and dive right in. 1. What are the various types of technical problems encountered during the mechanical ventilation of patients who are critically ill? System leaks, circuit malfunction or disconnection, inadequate FiO2, patient-ventilator asynchrony (inappropriate ventilator support mode, trigger sensitivity, inspiratory flow setting, cycle variable, PEEP setting, etc). 2. What is considered a problem in mechanical ventilation? A situation in which a person finds discord or is uncomfortable, which does not have an immediate solution. 3. What are the steps to solving a problem? (1) Analyze the parameters related to the situation, (2) Gather & assess related data, (3) Search for possible solutions, (4) Consider ramifications of possible solutions, (5) Attempt solution & observe response, and (6) Determine if problem is solved; if not undo initial solution and try another solution. 4. After responding to an alarm, what should the Respiratory Therapist assure? That the patient has adequate ventilation and oxygenation. 5. What are the steps that can be used to protect a patient when problems occur? (1) Respond to the alarm and (2) Ensure the patient is adequately ventilated (e.g., tidal volume delivery) and oxygenated. 6. What should the Respiratory Therapist assess? Observe the patient for chest rise and fall. Access the airway (ETT placement, cm at lip, visible secretions, patient biting the tube). Access the patient’s breathing (auscultation – rhonchi, coarse crackles, absent, wheezing, fine crackles). Check for disconnection of the patient off the ventilator. If so, manually ventilate the patient with a bag-mask valve. 7. The Respiratory Therapist should visually asses the patient’s what? The patient’s level of consciousness, color, use of accessory muscles. 8. If the problem can be quickly identified and rectified, what should the Respiratory Therapist do? The Respiratory Therapist can proceed cautiously but must monitor the patient throughout. 9. If the problem cannot be quickly identified and rectified, what should the Respiratory Therapist do? The RT should immediately remove the patient from the ventilator and initiate manual ventilation with a resuscitation bag. 10. What are the patient-related problems? Artificial airway problems, Bronchospasm, Secretions, Pulmonary edema/Pulmonary embolus, Dynamic Hyperinflation, Abnormal respiratory drive, Alternation in body posture, Drug-induced problems, Abdominal distention, Pneumothorax, and Anxiety. 11. What are the artificial airway problems? Tube migration, Rupture or leakage of the cuff, Kinking or biting of the endotracheal tube, Secretions/mucus plugging of airways, Cuff herniation over the end of the ET tube, Impingement of ET tube on the carina or airway, Tracheal fistula, and Separation of 15 mm airway adaptor from ET tube. 12. What is tube migration? Neck flexion/extension can move the tube 2 cm either above the vocal cords or into the right main stem bronchus. 13. How would you assess a rupture or leakage of the cuff? (1) Is the leak positional? If so, change the patient’s head/neck position, (2) Is there a hole in the cuff? If so, the tube must be changed, and (3) Is there a leak in the pilot balloon or severed balloon line? If so, use needle & syringe to temporarily refill cuff or replace pilot balloon or change tube. 14. How would you fix kinking or biting of the endotracheal tube? (1) Insert oral airway if the patient is biting the tube, or (2) If kinking is occurring, which is rare, it usually requires removal/replacement. 15. How would you rectify secretion/mucus plugging problems? You would suction or use hydration. 16. How would you fix cuff herniation over the end of an endotracheal tube? You would deflate the cuff. 17. How would you fix an impingement of endotracheal tube on the carina or airway? Pull the tube back 1-3 cm. 18. What is the proper endotracheal tube placement for men? 19. What is the proper endotracheal tube placement for women? 20. If a patient cannot be ventilated via ventilator or manual ventilation, what should the Respiratory Therapist do? Try passing a suction catheter through the tube. 21. If the catheter cannot be passed, what should the Respiratory Therapist check to see? Check to see if the patient is biting the tube. 22. If the patient is not biting the tube and the catheter still cannot be passed, what is the problem? 23. What should be done if there is an occlusion in the ET tube? Deflate the cuff to allow some ventilation and replace the tube. 24. How would you fix a tracheal fistula? It requires surgery to repair. 25. How do you fix a separation of a 15 mm airway adapter from an endotracheal tube? It can occur at any time, especially during mechanical ventilation. You grab tube with fingers or hemostats and reinsert adapter (push all the way in). 26. A pneumothorax is always a risk when you use what? 27. What are the two signs/symptoms of a pneumothorax? (1)Increased WOB (use of accessory muscles, uneven chest wall movement, absence of breath sounds on the affected side), and (2) Trachea will shift to the unaffected side. 28. What will occur if a tension pneumothorax is present? 29. What immediate treatment would you use for a tension pneumothorax? You would place a chest tube into the 2nd intercostal space at the midclavicular line. 30. How do you treat bronchospasm? It can occur in all patients (not just asthmatics); Treated initially with bronchodilators but steroids can be added if needed. 31. How would you rectify any secretion problems? (1) Suction & monitor thickness/color/amount, (2) Add heated humidification if thickening occurs, and (3) Send sample for testing if it’s yellow, green, or brown. 32. What is pulmonary edema and how do you treat it? For cardiogenic – pink, frothy secretions (cardiac problem); You treat with Lasix, digoxin, Vasotec, etc. 33. What is dynamic hyperinflation also known as? 34. What is dynamic hyperinflation? It can cause cardiac compromise and makes it more difficult to trigger breaths. You can treat it by adding PEEP, increasing expiratory time. 35. What is an abnormal respiratory drive? It is a sudden change in central respiratory drive and may manifest as bradypnea or tachypnea. It is usually caused by a neurological problem or medication. 36. How can changing the body position of a patient cause problems? It can cause accidental extubation, kinking of ventilator circuit, and changes in oxygenation (can be caused by repositioning of the diseased lung into dependent position, mucus plugging, dislodgement of the clot). 37. What is drug-induced distress? Chemical dependencies (drug, alcohol) may not be known and can cause restlessness, irritability, insomnia, and more. Many drugs given for beneficial effect may have side effects. 38. What is abdominal distention? An upward pressure on the diaphragm & can lead to atelectasis in lung bases, VQ abnormalities, and hypoxemia. 39. What are the 4 causes of abdominal distention? Air (common during intubation, PPV), Ascites (abnormal fluid accumulation in peritoneal space), Blood, and Obstruction. 40. What causes a pulmonary embolism? A blockage of an artery by a blood clot. 41. What are some signs and symptoms of pulmonary embolus? Normal aeration, Increased HR, BP, and RR, and Decrease in end-tidal CO2. 42. Where do you get an actual diagnosis for a pulmonary embolus? From a pulmonary angiogram or VQ scan. 43. How do you treat pulmonary embolus? 44. What is refractory hypoxemia? When you turn up the FiO2, but the saturation of the patient does not improve. 45. What are the 4 ventilator related problems? System Leak, Circuit malfunctions or disconnections, Inadequate FiO2, and Patient-ventilator asynchrony. 46. What are the 5 ways you can get patient-ventilator dyssynchrony? (1) Improper mode selection, (2) Inappropriate trigger sensitivity setting, (3) Inappropriate inspiratory flow setting, (4) Inappropriate cycle variable, and (5) Inappropriate PEEP. 47. What alarms are set off when a leak occurs? Low-pressure alarms and low volume alarms. 48. Where do most leaks occur? 49. What other places can leaks occur? The humidifier/HME, Water Trap, In-line suction catheter, and Temperature probe. 50. What two ways can inadequate oxygenation be caused? It can be caused by the patient or ventilator, but it usually caused by the patient. 51. What else could be a reason for inadequate oxygenation, but rarely is? Improper gas mixing in the ventilator. If this is in this question, analyze the FiO2 at the exhalation port (leading to the patient) on the ventilator. 52. If the mode of ventilation does not match the patient condition, what does this cause? It may cause the patient to have increased work of breathing. 53. If there is an improper setting of the sensitivity (pressure or flow), what could this cause? This could cause an increased work of breathing. 54. If there is an inadequate inspiratory flow that is set, what could this cause? This is a frequent cause of increased work of breathing. 55. If the low-pressure alarm is going off, what should the Respiratory Therapist check? Check for patient disconnection, Check for leaks in the patient circuit related to the artificial airway and through chest tubes, and Check the proximal pressure line to make sure it is connected and unobstructed. 56. A low-pressure alarm may be accompanied by what other alarms? Low minute ventilation or low tidal volume alarm. 57. A high-pressure alarm can go off if the patient is doing what? Coughing, has secretions, or is biting the ET tube. 58. The high-pressure alarm can also go off when? When the airway resistance has increased and the lung compliance has decreased. 59. What should you check when looking at the low PEEP/CPAP alarm? You should check to see if it is set below the set PEEP level. 60. What do you need to determine if the low PEEP/CPAP alarm is going off? If the patient is actively inspiring below baseline or if a leak is present/ventilator has not been disconnected from the circuit. 61. What is the apnea alarm used for? It is used to determine if the patient is apneic or not. 62. What should you do if the alarm goes off and the patient is actively breathing still? Check the unit for leaks, check the sensitivity setting to ensure the ventilator can detect patient effort. 63. What is the low source gas pressure alarm? Check to ensure that a 50 psi gas source is available (i.e. wall pressure is adequate, cylinder is full, etc. ), check high-pressure hose connections to the ventilator. 64. What should the Respiratory Therapist do when you get an Ventilator Inoperative Alarm? Since it is an internal malfunction present at start-up, you can try turning the ventilator off and restarting it. If the alarm continues, follow message instructions or replace ventilator. The safest thing to do is to replace ventilator and while doing that, bag-mask the patient. 65. What is the I:E ratio alarm? It is a flow problem and it usually indicates an I:E ratio greater than 1:1. 66. What should you do if the I:E ratio alarm goes off? Check for increased Raw or decreased Cl to see if that has resulted in lower flow; if so, treat the causes. 67. How would you treat an I:E ratio problem in Volume Ventilation? 68. What should the Respiratory Therapist do if you want an inverse I:E ratio? Disable the alarms, otherwise, they will continue to go off. 69. Why would the High PEEP/CPAP alarm go off? Causes are similar to those of the high-pressure alarms – coughing, secretions, biting the tube, increased Raw, decreased compliance. 70. Why would a Low tidal volume, minute ventilation and/or respiratory rate alarm go off? 71. Why would High tidal volume, minute ventilation and/or respiratory rate alarm go off? Check the machine sensitivity for auto-triggering, make sure the alarms are set correctly; if using an external nebulizer – reset the alarms until the treatment is done. 72. Why would the Low or High FiO2 alarms go off? Check gas source and make sure gas analyzer is functioning properly. 73. What are the signs and symptoms associated with patient-ventilator asynchrony? Use of accessory muscles to breathe (inspiration: Sternocleidomastoid, chest retractions, due to inadequate flow or low Vt delivery/ expiration: abdominal muscle usage), Pursed-lip breathing (to keep patient’s airways open), Minimal or absent cough, Tripoding (leaning forward to breathe), Barrel chest (air-trapping), Digital clubbing, Dyspnea on exertion (late sign), Tachypnea, and Tachycardia (sign of hypoxemia). 74. What are the ways that the addition of a nebulizer powered by an external source gas can affect ventilator function? High tidal volume delivery from the flow meter or E-cylinder application, Increased work for the patient to trigger the ventilator if the nebulizer is used in PSV, Triggering difficulty for patients in VC-CMV receiving a nebulizer treatment from an external source, and it also affects neonates significantly. 75. What would you see with the presence of unintended PEEP (auto-PEEP) by looking at the ventilator graphics? You can observe and assess the flow-time or volume-time curve. Flow-time curve: The Respiratory Therapist would see that the peak expiratory flow does not return to the baseline before the next breath. Volume-time curve: During the expiratory phase, the tidal volume does not return to the ventilator before the next breath. 76. What are the potential problems associated with using a heated humidification system during mechanical ventilation? The drying of secretions due to inadequate humidification. So there you have it! That pretty much wraps up our study guide on Mechanical Ventilation Troubleshooting. What did you think? 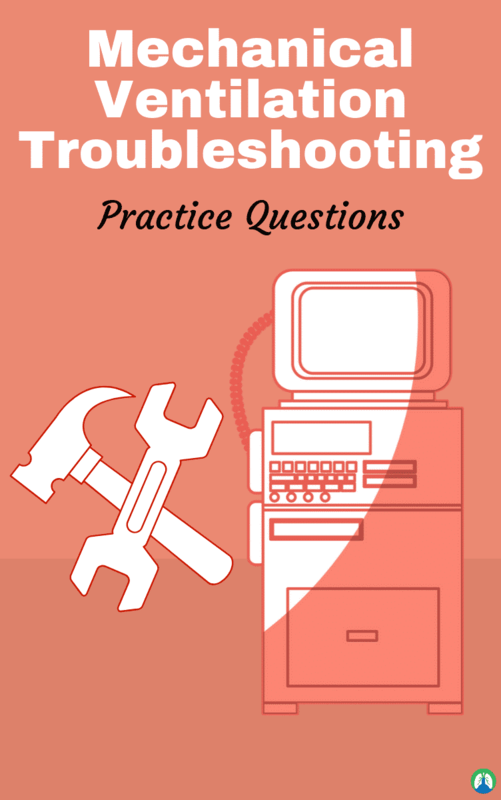 I hope this information was helpful to you and I hope that these practice questions give the confidence that you’ll need when it comes times to overcome mechanical ventilation issues once you start seeing your own patients. You’ll be just fine as long as you truly learn and understand this information. Thanks for reading and as always, breathe easy my friend.